Orbital Gate Assault in Super Smash Bros. for Wii U.
Orbital Gate Assault (オービタルゲート周域, Orbital Gate Area) is a stage in Super Smash Bros. for Wii U based on Star Fox: Assault. It is partially set aboard the Great Fox, as with the previous Star Fox stages Sector Z, Corneria, and Venom. There are also sections set on top of missiles and on Arwings. It was confirmed as a stage on October 1, 2014, although a Pic of the Day teased it more than two months prior. In Wii U, Falco is fought here for his unlock battle. The players start on top of the Great Fox, with some Arwings flying overhead. Unlike previous games, the Great Fox faces right instead of left. The ship's jet blast can inflict damage as long as players are in contact with it. An Aparoid missile then shows up on screen and the Great Fox flies away, forcing players onto the missile. An Aparoid fighter will crash onto the missile, damaging any player, but will also release an item if items are turned on. Items from the fighter will appear in Sudden Death as well. Arwings will quickly fly off-screen, KOing anyone who remains on them. Like the Great Fox, the missile's jet blast damages players. The missile accelerates briefly until crashing into the Orbital Gate's force field. The shockwave can inflict damage and knockback, but any KOs from it only counts as a self-destruct regardless of whoever is the last player to damage the opponent. It is possible to go beyond the force field with a fast enough character. Three Arwings will destroy the missile, briefly tossing anyone who stands on it in the air, and players then land, on the Arwings. The Arwings will fly through the gate and will barrel roll away dropping players on to the second missile. Like the first missile, the second missile accelerates and hits the force field, this time facing left. The Arwings destroy the missile again, forcing the players on top of them, the Arwings are facing to the left this time. The Arwings will then try to evade Mini-missiles and one of them will explode, damaging whoever was in the blast, but only KO'ing around 250%. The Arwings will eventually drop players back on the Great Fox, starting the stage's cycle anew. Having every player hold what is usually the shield button upon choosing the stage will result in conversations taking place via various characters while the battle is going on as long as no player is Fox or Falco. The Ω form features a platform with the design of the orbital gate. It takes a different path than the normal version. The Great Fox and the fights between Cornerians and Aparoids are absent. When playing with less than 5 players, Arwings can still be seen flying in the background, but they do not affect the play area. The Orbital Gate as it originally appeared in Star Fox: Assault. This stage is based on the eighth story mission in Star Fox: Assault. This mission sees the parasitic Aparoid race mount a direct attack on the Star Fox team's homeworld, Corneria, in a last-ditch attempt to prevent the deployment of an Aparoid-eradicating virus. In an Arwing-only battle within the planet's orbit, the team works with rival unit Star Wolf along with the Cornerian Defense Force to repel the Aparoid forces and destroy several missiles targeting the space station on which the virus is being developed. The stage is universally banned in all rulesets. The multiple phases of the stage and the hazards disrupt gameplay. In addition, characters with good mobility can easily stall and camp due to being able to easily jump from Arwing to Arwing. Orbital Gate trophy in Super Smash Bros. for Wii U. The site of a battle in Star Fox: Assault. 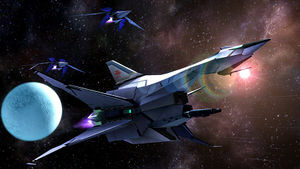 After locating the enemy homeworld, the Star Fox team was standing by at the Orbital Gate to begin the final attack, but the Aparoids suddenly mounted an offensive of their own! In the Smash Bros. stage, you fight atop the Arwings and enemy missiles as they battle it out. The site of a battle in Star Fox: Assault. After locating the enemy homeworld, the Star Fox team were standing by at the Orbital Gate to begin the final offensive, but the Aparoids suddenly mounted an offensive on the gate itself. In the Smash Bros. stage, you fight atop the Arwings and enemy missiles as the battle rages on. The Great Fox section of the stage. The missile section of the stage. The Arwing section of the stage. Peach, Palutena, and Samus on a missile. Peach, Palutena, and Samus on the Arwing section. The Great Fox as it appeared in Star Fox: Assault. If certain Final Smashes are used at the precise moment, it will result in there being no platforms to land on. According to Masahiro Sakurai, the stage took an entire year to develop. This stage comes from Mission 8 in Star Fox Assault but includes new voice conversations for each character on the Star Fox team. What is odd about these conversations is the lack of the Star Wolf team, which was actually also present in helping protect the gate from incoming missiles. Not only is the Star Wolf team missing, but Krystal doesn't make an appearance either. This is the first Star Fox stage to lack any appearance of Wolfens. This is the only Star Fox stage to feature the Great Fox as a stage element which doesn't feature it as a permanent platform. Hitting the second missile before it actually comes in the playable area will deal 12% and medium knockback. It shares this mechanic with Pilotwings and Skyloft. The stage has glitchy collision detection that can occasionally cause players to fall straight through hard platforms. Normally, the missile explosions will not KO characters, but if a character is either light enough by being shrunk, has a high launch rate or has low enough defense, the missile explosion will send them into the upper blast line for an OHKO. Using a Final Smash that stops the stage (such as End of Day or Super Pac-Man) or pausing in Training Mode while the missile is exploding will result in there being no platforms, making every player SD until the Final Smash ends or Training Mode is unpaused. Orbital Gate Assault is one of five stages from Super Smash Bros for Wii U not to return in Super Smash Bros. Ultimate, the others being Pyrosphere, Woolly World, Jungle Hijinxs and Miiverse. This page was last edited on April 17, 2019, at 02:50.